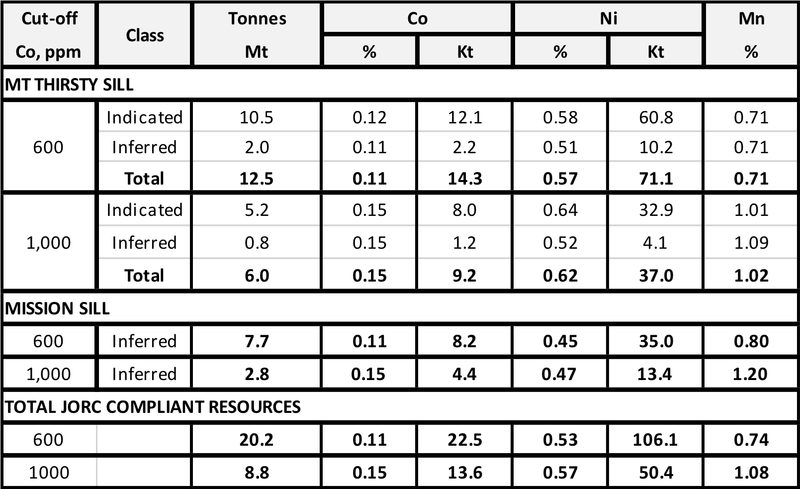 Mineral Resource Estimates (MREs) of lateritic Co-Ni mineralisation developed on the Mt Thirsty and Mission Sills have been carried out by CSA Global in 2017 under the JORC Code (2012 Edition). The Resources are reported at two cut-off grades, 600 ppm Co and 1,000 ppm Co (Table 3). 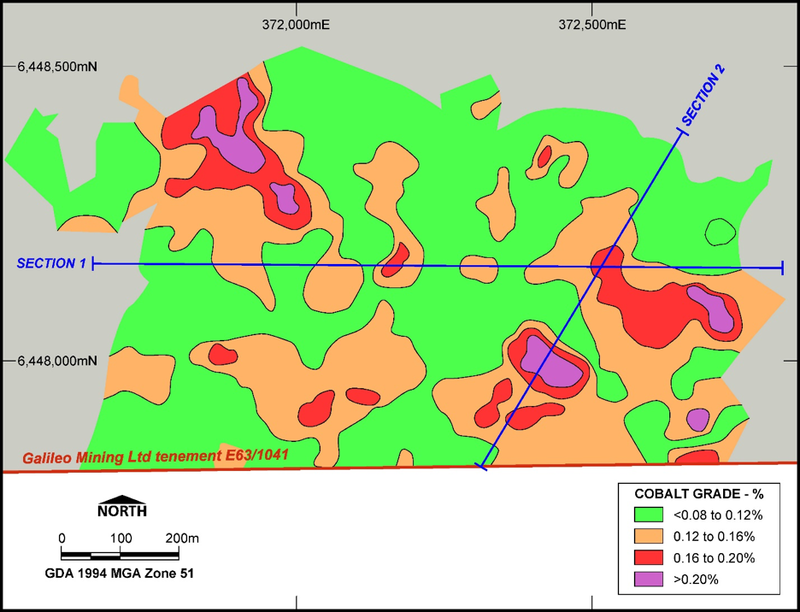 The total Indicated and Inferred JORC compliant Mineral Resource is 20.2Mt grading 0.11% cobalt, 0.53% nickel and 0.74% manganese at a cut-off of 600ppm cobalt containing 22,500 tonnes of cobalt and 106,000 tonnes of nickel. Importantly the resource also contains a higher-grade component of 8.8Mt grading 0.15% cobalt and 0.57% nickel at a cut-off of 1000ppm cobalt. The MREs were based on samples from aircore drilling in the case of Mt Thirsty, and predominantly reverse circulation drilling for Mission Sill. The analytical method used for Co and Ni samples was ICP-OES after four-acid digestion, and for gold-Pt-Pd samples fire assay was used. QA/QC measures included the use of analytical blanks, field duplicates, pulp duplicates and a range of Certified Reference Material standards. CSA Global concluded that the data was suitable for the purpose of generating a MRE. The dry bulk density factor used was 1.5 t/m3, based on a database of 385 determinations derived from the 2017 program of sonic core drilling. Figure 3 shows Co distribution by grade across the Mt Thirsty deposit, and Figure 4 displays the two cross sections shown on the plan. The cross sections clearly depict the concentration of Co mineralisation just beneath the top of the lower saprolite horizon. The information on this page that relates to Exploration Results, Mineral Resources or Ore Reserves is based on information compiled by Michael Elias, who is a Fellow of The Australasian Institute of Mining and Metallurgy. Mr Elias is employed by CSA Global Pty Ltd.
Mr Elias has sufficient experience which is relevant to the style of mineralisation and type of deposit under consideration and to the activity he is undertaking to qualify as a competent person as defined in the 2012 Edition of the “Australasian Code for reporting of Exploration Results, Exploration Targets, Mineral Resources and Ore Reserves”. Mr Elias consents to the inclusion in this announcement of the matters based on his information in the form and context in which it appears.